Mozart, A New Natural "Drug" To Help Preemies Gain Weight? Premature babies must gain a certain amount of weight before they can leave hospital. Listening to Mozart could help, finds a new Middle East research study. Studies show that listening to music composed by Wolfgang Amadeus Mozart in the 18th century has a positive effect on the brain of developing babies. Now a new study in Israel has found that Mozart’s music also appears to have a positive effect on babies born prematurely. The researchers found that exposure to Mozart’s music causes preemies to expend less energy, which results in faster weight gain and an earlier release home. Conducted at the Departments of Neonatology and Pediatrics at the Tel Aviv Sourasky Medical Center, medical researchers found that just 30 minutes of Mozart a day can make a world of difference in the development of premature babies. Published in the medical journal Pediatrics, the study by Dr. Dror Mandel and his colleagues was part of an international program NIDCAP (Newborn Individualized Developmental Care and Assessment Program) that investigates diverse methodologies for improving infant welfare in neonatal units. It is understood that environmental conditions such as light levels, tactile elements and diverse sounds may influence the rate at which newborns develop. 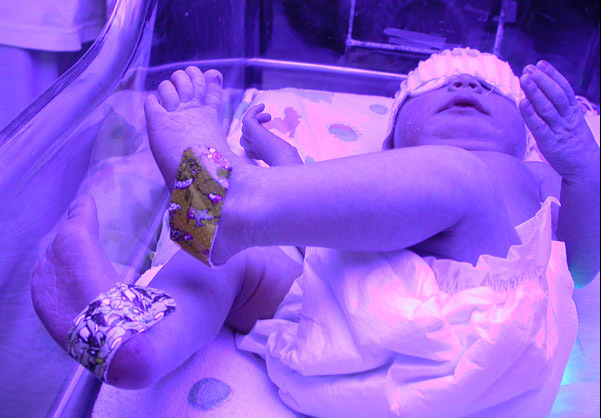 Medical teams around the world, working with permission from the Helsinki Committee, test their hypotheses to see if there are optimal conditions in the hospital for a speedy release of prematurely born babies. According to Mandel, the earlier a pre-term baby can be released, the less he or she is at risk. “That’s the main basis for this research. We want them to gain weight and to be released as soon as soon as they can be,” he tells ISRAEL21c. In the hospital, pre-term babies may be susceptible to infections, but before they can be released home, the infants must gain a certain amount of weight. Exposure to Mozart, Mandel and his colleagues have found, may speed up weight gain so babies can be home sooner with their families. This protects them not only early in life, but in later life too, he explains. The researchers exposed 20 babies with healthy and appropriate weights for their age to a 30-minute period of either Mozart or no music on two consecutive days and measured their metabolic activities. In all the babies studied, listening to Mozart lowered the amount of energy they expended, which means that they were able to gain weight faster. While this is an encouraging result for the use of Mozart in neonatal units, this is just an early study: “We don’t really know what are the long term effects of this music,” says Mandel. Studies like these are intended to scientifically quantify the hypothesis that the environment – and the use of music – can be optimized for rapid release of infants from the hospital. “We don’t really know how the sounds they hear or how the tactile stimulations they get from the nurses affect development,” says Mandel. “They all have an effect on the development. NIDCAP is a program that looks at all these elements together. For example, it has been found that a bath and diaper change for the baby should be done at the same time. It is better for them if we cluster interventions. As part of this program we looked at music effects: The music they hear and the sounds they are being exposed to, because there is a concern of the effects of these stimuli on their development. The Israeli team chose Mozart over other classical composers such as Beethoven due to the “Mozart Effect” measured in college kids. The study found that those listening to Mozart prior to an IQ test could score higher. It has also been found to positively affect epileptics. Although nobody yet understands why this is so, when the music of Mozart, Bach, Chopin, Wagner and Bartok were compared, the best effects were measured with Mozart’s music. While the first study is encouraging, “We don’t know if it’s a music effect or the Mozart Effect,” says Mandel who with his team is now investigating a range of music including ethnic music and its effect on the infant after birth, compared to what the infant was exposed to in the womb. “We think there is something in the organization of the cortex [of the brain] which resonates with the Mozart music. I am not an expert on music, but we will see,” he concludes. This story was republished with permission from ISRAEL21c – www.israel21c.org.